There has been more and more cases of opiate addiction among young people. Islanders have been demanding more access to treatment and recovery services. But addiction doesn't only affect the addict ... those around them also face pain and shame. Two Mothers of addicts are starting a support group for loved ones of addicts. Rose Barbour and Roni Power have started the 3 C's Support Group. Rose Barbour also operates the blog "Living Under the Shadows". 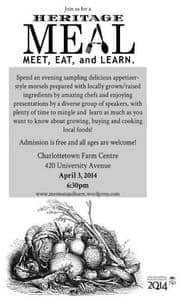 The Heritage MEAL "Meet - Eat - And - Learn"
The Heritage M-E-A-L, which stands for "Meet - Eat - And - Learn", is also a chance to celebrate PEI's rich food, farming history and explores ways to rejuvenate the local food system. Shannon Courtney, one of the organizers of the Heritage MEAL, spoke with Karen Mair about the event... which takes place on Thursday at 6:30 pm at the Farm Centre on University Ave in Charlottetown. When communities had the chance to organize events tied into the 150th anniversary celebrations, folks in Souris thought about their beautiful harbour. The result is the 150 Sailing Challenge. It's sponsored by the Souris Harbour Authority. Alan Holman is helping to co-ordinate the 150 Sailing Challenge. 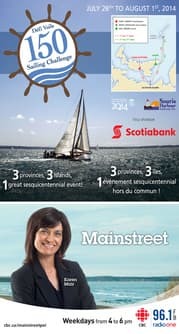 For all the details just google 150 Sailing Challenge or Souris Harbour Authority. Wed., 2 – The Heritage MEAL "Meet - Eat - And - Learn"